El Cerrito, true to it’s name, sits on a hill with breathtaking views of The Walking 18 Ranch. It offers a full venue for hosting weddings, meetings or special events. El Cerrito is set apart from other area venues and banquet halls in more than one way. The stunning architecture and design is like no other local event venue in East Texas. From the loft balcony that overlooks the main banquet hall, to the fully functional cantina and the breathtaking views, we designed every aspect of the venue so that you and your guests feel special and welcome from the moment you walk in the front doors. We believe we have created the perfect slate for any theme of your choice. If you are looking for an outdoor event, or an indoor or both, we look forward to serving your needs. Here are just some of the venue’s unique features: A concrete circle drive makes loading and unloading convenient and comfortable and gives the option for valet parking. The spacious front porch is one of several areas to visit with friends and survey the scenery. The covered side patio is adjacent to the cantina and features an outdoor fireplace, and room enough for a few small tables so that guests can sit and relax with a great view. Custom twin doors open into the grand entry. There is plenty of room to receive guests or direct them to the event. The reception/banquet hall has room for over 200 guests with 20+ foot ceilings and large upper and lower level windows overlooking the back of the property. A special catering kitchen makes serving your guests easy and efficient. The 12' x 12' doors in the reception/banquet hall give you the option of opening the hall up to the 2600 square foot rear patio. The rear patio has any number of potential uses such as a tented reception area or a dance floor. Your guests will enjoy the wonderful view from the hilltop while dancing the night away. If you choose to stay inside, there is also a full service cantina that has its own covered patio with outstanding views of the property and lakes. Indoor and outdoor fireplaces keep guests cozy on chilly evenings. 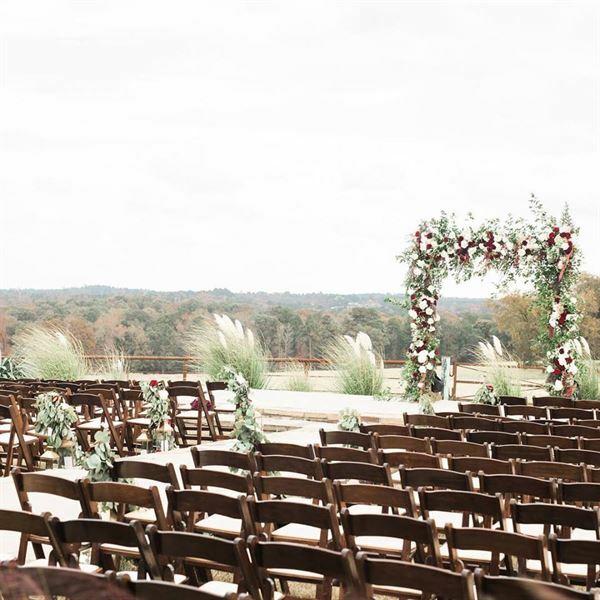 The bride’s room, on the second level, is a spacious room with more stunning views of the ranch and lakes. It’s the perfect place for a bride to feel relaxed as she prepares for her special day. Special Features: We have a beautiful indoor temperature controlled main event room that seats 200 comfortably. Large double doors open to view the beautiful Walking 18 Ranch and outside area that includes a covered bar area, 2 outdoor fireplaces and slab for more seating.